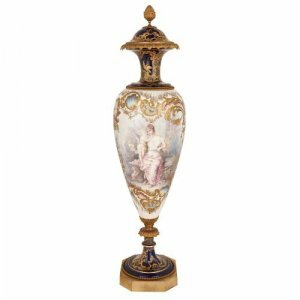 The Sèvres Porcelain Manufactory has been creating fine porcelain wares since the early 18th Century. The firm was originally founded under the name of Manufacture de Vincennes in 1738, and received royal support from King Louis XV of France and his mistress, Madame de Pompadour. In 1756, Madame du Pompadour requested that the manufactory move to a building in Sèvres in order to be near her chateau. Soon after its relocation, Manufacture de Vincennes became known as Manufacture de Sèvres, receiving a royal warrant in 1759. From its very beginning, Sèvres porcelain had the support and admiration of the French royalty. 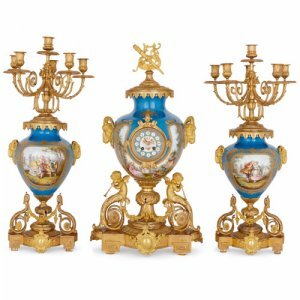 This popularity continued across European nobility throughout the 18th and 19th Centuries, as the firm quickly garnered a reputation for producing wares of exceptional quality and design. The Sèvres manufactory became particularly famous for producing porcelain works with a distinctive blue glaze, made from a cobalt oxide; the shade became known as ‘Sèvres blue’. One of the firm’s major breakthroughs was to manufacture works in hard-paste porcelain. Previously, French porcelain had only been made in soft-paste, but in 1770 Sèvres became the first French manufacturer to produce hard-paste porcelain wares. These hard-paste creations had the advantage of being more robust than their soft-paste counterparts, and were less likely to crack when exposed to heat or liquid. This impressive invention further augmented the reputation of the Sèvres manufactory, causing it to attract the very finest ceramicists. 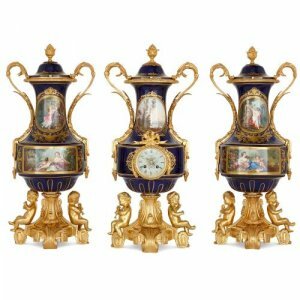 The excellence and prestige of the firm drew in famous artists from far and wide, including Francois Boucher, Albert-Ernest Carrier Belleuse, Alexander Calder and Rodin. In the late 19th Century, the manufactory moved premises once again to a site that had been specially built by the French state, next to the Parc de Saint-cloud. It was here that the 1920 Treaty of Sèvres, the peace treaty between the Ottoman Empire and the Allies at the end of the First World War, was signed. Today, Sèvres continues to produce porcelain works of the highest quality. The firm remains on its site by the park, and although it is classed as a Monument Historique by the French government, the Sèvres porcelain manufactory remains highly active.